Lambert & Rehbein (SEQ) Pty Ltd (L&R) was commissioned by a Private Client to conduct a Detailed Ecological Assessment (DEA, Vegetation Management Plan (VMP) and a Conceptual Rehabilitation Plan (CRP) for a site located at 342 Benhiam Street, Calamvale. Further described by the Department of Environment and Resource Management (DERM) as Lot 179 on RP92598 ‘the site’ comprised approximately 1.1ha of densely vegetated land on the eastern side of Benhiam Street. The DEA, VMP and CRP were compiled as environmental supporting documentation for a residential subdivision development proposed for the site. The assessment included a comprehensive environmental legislative review of Federal, State and Local Government requirements in light of the proposed disturbance. The assessment also included review of the site at a local, sub-regional and regional scale for ecological functionality and proposed mitigation measures in light of identified potential impacts. 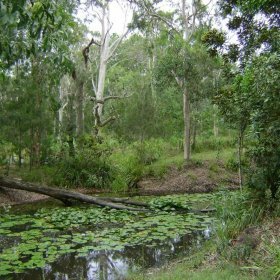 The administering authority – Brisbane City Council (BCC) dictated that a detailed Fauna Site Usage Analysis was required for the site. It was suspected that the mature vegetation within the rear half of the site was being utilised by a local colony of Squirrel Glider (Petaurus norfolcensis) – a BCC Significant Species. This required detailed flora and fauna species lists to be compiled to demonstrate proposed disturbance would not impact on Species of Significance. These lists were compiled utilising various nocturnal and diurnal surveying techniques including stag-watching and spotlighting (used to ascertain nocturnal fauna populations within the site). The assessment and “realistic” recommendations proposed by Lambert & Rehbein, through collaboration with other professional bodies on the project team, resulted in the retention of key habitat within the site, whilst achieving the desired yield for the client.